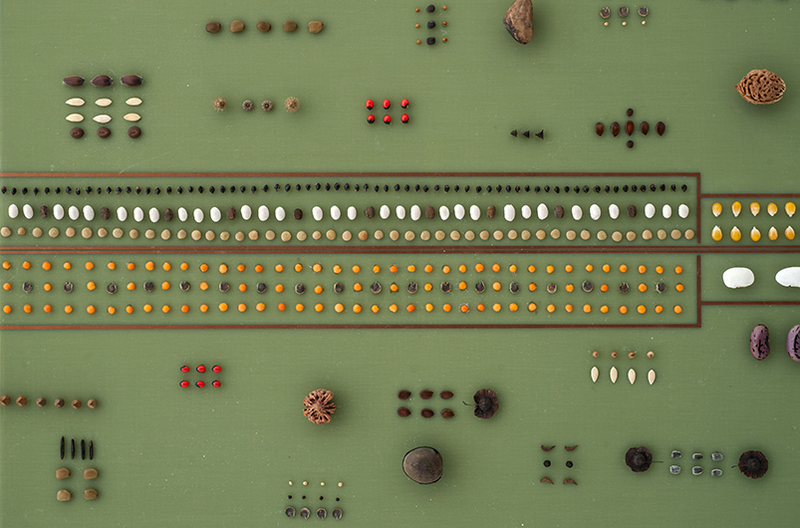 Printed circuit boards (PCB), various seeds. Biodiversity is in dangerous decline, in both animal and plant kingdoms. One of the attempts to secure survival of as many different plant species as possible is the creation of gene banks in seed vaults and time capsules. In 2008, Norway opened the Svalbard Global Seed Vault, a collection of duplicate samples or “spare” copies of seeds held in gene banks worldwide, as a fail safe in case of regional or global crises. In 2018, the collection surpassed one million samples, containing more than one third of the world’s most important food crop varieties. 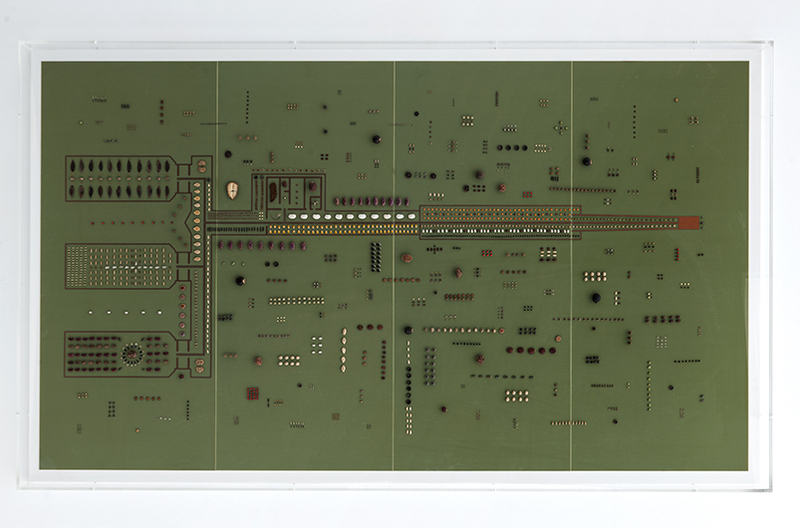 The Great Decline combines the blueprints of the Svalbard Global Seed Vault, visualised as a copper circuit on large scale PCB’s (Printed Circuit Boards), and a wide variety of collected seeds from around the world. Together they create a huge Lukasa, or memory board, that was used by the Bambudye within the Luba Kingdom in the Democratic Republic of Congo throughout the 19th and 20th Century, as an archive for the topographical and chronological mapping of political histories, to recollect important people, places and mythical migration routes. The seeds on The Great Decline are collected at the Botanical Garden of Meise (Belgium), Jardin Botanique de Lubumbashi (D.R. Congo), and various other places around the world. They are organised in relation to the graphical outlines of the Svalbard Global Seed Vault and mimick transistors and other electrical components that are mounted on PCB’s. They evoke the memory of seed collection, preservation, modification and militarisation.